Does 2 Corinthians 3 say the Ten Commandments are abolished? Home > 2002 > Authors > Bible Study > Law > Law > Lynnford Beachy > March 02 > Newsletters > Questions and Answers > Does 2 Corinthians 3 say the Ten Commandments are abolished? In 2 Corinthians chapter 3 there is a very clear passage directly referring to the Ten Commandments. Paul refers to them as “the ministration of death, written and engraven in stones.” He is saying that while this ministration of death is glorious, the ministration of the New Testament, the New Covenant, exceeds in glory. So this ministration of death, the Ten Commandments, is inferior, and in verse 11 he says that they have been done away with. A very simple and clear message. I am simple enough to accept it for what it says. I am certainly glad that you are willing “to accept it for what it says.” Let us read these verses in context, one at a time, to see what they say. 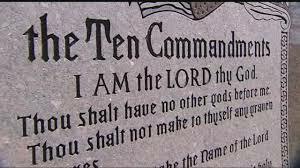 There is no doubt that the phrase “written and engraven in stones” refers to the Ten Commandments. Notice that Paul does not say that that which was “written and engraven in stones” was done away, but he said the “glory was to be done away.” Paul said that the “ministration” of the law “was glorious,” “which glory was to be done away.” It is clear from this verse that Paul was not referring to the Ten Commandments as being “done away.” This fact is made even more certain when we look at other verses written by Paul. The beginning of Romans chapter three is taken up with Paul proving, from the Old Testament, that every man is a sinner in need of a Saviour. He wrote, “Now we know that what things soever the law saith, it saith to them who are under the law: that every mouth may be stopped, and all the world may become guilty before God.” (Romans 3:19) Here Paul says that “the law” speaks that “all the world may become guilty before God,” “that every mouth may be stopped.” According to Paul, the law speaks to every man, convicting them of their guilt. A law that has been done away could not possibly convict a man of his guilt. If I am driving down the road at 70 miles per hour in an area where the speed limit used to be 55, but now has been done away, can that abolished law possibly convict me that I am guilty of breaking it? Certainly not! An abolished law is useless, and unable to convict of sin. Notice how Paul ends Romans chapter three. After explaining how we can be justified of our transgression of the law, he wrote, “Do we then make void the law through faith? God forbid: yea, we establish the law.” (Romans 3:31) It would be pointless and ridiculous for Paul to say that we establish an abolished law. Furthermore, he said clearly that we do not make void the law. In other words, the law is still in effect. This point is brought out even more forcefully by the words of James, when he wrote, “For whosoever shall keep the whole law, and yet offend in one point, he is guilty of all. For he that said, Do not commit adultery, said also, Do not kill. Now if thou commit no adultery, yet if thou kill, thou art become a transgressor of the law. So speak ye, and so do, as they that shall be judged by the law of liberty.” (James 2:10-12) James was evidently referring to the Ten Commandment law as “the law of liberty” by which we “shall be judged.” You can be certain that we will not be judged by a law that has been abolished. Also notice that James said that if you break the Ten Commandment law you are a “transgressor of the law.” John wrote, “Whosoever committeth sin transgresseth also the law: for sin is the transgression of the law.” (1 John 3:4) If the law has been abolished, it is not possible for anyone to transgress it and, hence, there would be no such thing as sin or sinners, and no need for a Saviour. Certainly nobody could accept such an absurd idea, yet if we make the claim that the law is abolished we have no choice but accept the inescapable conclusion that sin is non-existent and needs no pardon. Again, Paul wrote, “What shall we say then? Is the law sin? God forbid. Nay, I had not known sin, but by the law: for I had not known lust, except the law had said, Thou shalt not covet.” (Romans 7:7) It is certain that Paul is referring to the Ten Commandment law because he quoted the tenth commandment. He goes on to say, “Wherefore the law is holy, and the commandment holy, and just, and good… I consent unto the law that it is good.” (Romans 7:12, 16) It is evident that in 2 Corinthians 3:7 Paul was not referring to the law as being done away, but to the glory that attended Moses’ ministration of that law. Furthermore, God said that the New Covenant consisted in Him taking that same law and writing it in our hearts. (Hebrews 8:10) As we continue with the remaining verses of second Corinthians chapter three we will see this point brought out more clearly. Notice that Paul is referring to the ministration of the law as glorious, rather than the law itself. Notice, Paul said that the vail over Moses’ face hid “that which is abolished.” What was the vail hiding? Not the Ten Commandment law engraved in the stones which he was holding in his hands, but the glory of Moses’ ministration of that law. That is what was abolished. When we read the whole passage of second Corinthians chapter three in its full context it is indeed very clear.